In 2015, the global community committed to halving road deaths and serious injuries by 2020. But city streets are still not safe. More than 3,200 road fatalities occur every day, and this number is expected to increase threefold by 2030, as more cars hit the road. An additional 20 to 50 million people are non-fatally injured and left with permanent disabilities. The impacts are pervasive. Economic productivity goes down. Quality of life suffers. Unsurprisingly, cities with poorly designed street networks see the most damage. In fact, 90 percent of the road fatalities occur in low and middle-income countries. 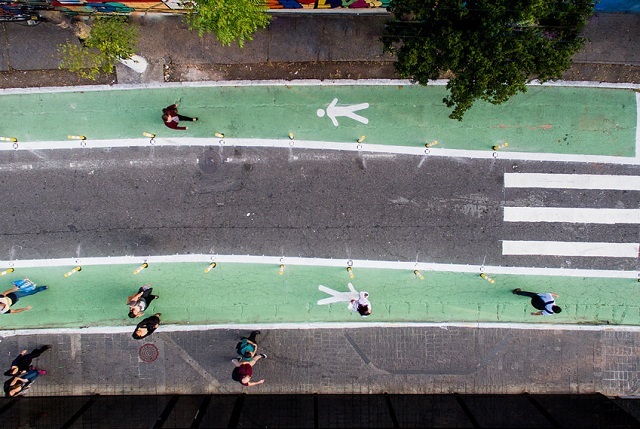 Fortunately, we are now witnessing a global movement to rethink how streets are designed for all road users, a trend that is working against the rising numbers of vehicles on the road and people living in urban areas. Making street environments safer used to be limited to certain European cities such as Amsterdam or Copenhagen, places where good design has been put to practice for the last 40-plus years. Today, these improvements are felt around the world. Below, we highlight five cities from Brazil, China, Colombia and India that are changing the way people experience cities. Each is implementing innovative, evidence-based design interventions as part of the Bloomberg Initiative for Global Road Safety. Joel Carlos Borges Street connects São Paulo’s Berrini Train Station to the city’s central business district. It accommodates thousands of daily users. Before September 2017, the street had narrow sidewalks that were unable to safely accommodate the heavy pedestrian flow (around 22.5 people per vehicle during peak hours). As the central road to the transit station, this was a major safety hazard. The city decided to redesign Joel Carlos Borges to include more space for pedestrians, improve signage, lower speed limits and add street furniture and green infrastructure. The narrow and run-down sidewalks now have an additional 3.5 meters in width, providing ample space for foot traffic. Widening sidewalks and narrowing vehicle lanes slows traffic and creates a more pleasant and safer experience for everyone. This new and improved “complete streets” design not only provides safer street standards but also reminds drivers that pedestrian safety is crucial and should be top-of-mind when driving. This was the first temporary road intervention in the city and was well received by the public. The city is now considering similar efforts elsewhere. Cidade 2000 is a residential neighborhood by day and a lively restaurant district by night. Despite the large volume of pedestrians, the street space was heavily dominated by vehicles and traffic, leaving walkers and cyclists vulnerable. To improve pedestrian safety, Fortaleza announced a low-speed area in May 2017, turning 1,200 square meters previously used for parking and traffic lanes into a functional plaza for pedestrians. Then, in September 2017, the neighborhood received the first traffic-calming interim street transformation, named Cidade da Gente (“City of People”). The intervention included removing a traffic lane, decreasing the speed limit to 30 km/hr, widening sidewalks, and implementing curb extensions and five new pedestrian crossings. The transformation also included street art, green infrastructure and street furniture to create a more defined space for pedestrians and make the street more welcoming. The project has shown residents how tactical urbanism can bring new life to run-down streets. Due to immense positive public feedback, the interim intervention is now being developed into a permeant installation. The mayor has also announced the city will conduct similar low-cost interventions in other areas. The Nagpada intersection, like many others in Mumbai, is chaotic and challenging to navigate for all users, vehicular and otherwise. The triangular junction connects six major streets and feeds many school districts. But it was accommodating just 3,000 vehicles per hour at peak times, while creating heavy congestion. Pedestrians had little to no sidewalk space, and the sidewalk space that existed was in very poor condition. All these factors led to an intersection that was inefficient, dangerous and confusing. Road crash data revealed that Nagpada accounted for a staggering one-third of all road traffic fatalities in Mumbai. In August 2017, the intersection’s triangular geometry was modified temporarily by the city to channel traffic and provide safe pedestrian pathways. Crossing distances were minimized and designated crossings were installed on all sides of the intersection. The design also reclaimed a large illegal parking space and transformed it into a pedestrian plaza. The chaotic intersection became a community gathering place. The new arrangement also made intersection management easier for the Mumbai Traffic Police. The success of the Nagpada redesign has led the city to commit to its permanent implementation. Bogotá’s Kennedy District is well-known for its heavy pedestrian and bicycle traffic. For many Bogotá residents who live in the periphery of the city, bicycling is often the most convenient way to travel between home, work, school or other destinations. Between 2013 and 2017, however, 61 road traffic crash injuries and 1 fatality were registered at the intersection of Carrera 80 and Calle 43 Sur. Pedestrians and cyclists were at risk due to the lack of road markings and ramps, in addition to the absence of traffic lights for pedestrians and cyclists to safely cross the road. The presence of ill-designed medians along the street led cyclists to oncoming vehicles and generated conflicts between pedestrians and cyclists. To create safer road conditions, the city redesigned the intersection in January 2018. The renovation included lowering the medians to improve the comfort and safety of cyclist and pedestrians, adding road markings for bicycles and zebra stripes, improved access ramps to the sidewalks and bike paths, and traffic lights for pedestrians. The renovation provided a safe, continuous, separated path for cyclists and improved the comfort and safety for pedestrians. Zhengtong Road connects the commercial Yangpu District with a high school and the Fudan University campus in Shanghai. The 15 to 20-meter-wide road caters to mixed traffic and heavy pedestrian flows. Zhengtong lacked quality walking and biking infrastructure, making it challenging for pedestrians and bikers to travel safely. Another concern was an unsafe pedestrian crossing infront of a middle school. To foster a safer pedestrian and biking environment, Yangpu District installed protected bike lanes and improved sidewalks. The district also narrowed the street, making it easier for pedestrians to cross, added reflective materials (powered by solar panels) to stop lines, and placed distinctive road markings, warning signs and other signs in front of schools. The street transformation was well received by district officials and rated favorably by bike commuters and students. Zhentong Road is now used as an example of road safety around schools in other districts of Shanghai. Urban streets are some of our most fundamental shared public spaces, but they are also one of the most challenging and overlooked. Once a niche dominated by only a handful of places, cities everywhere are realizing that small street design changes often yield impactful results. Nikita Luke is a Research Assistant for Health and Road Safety at WRI Ross Center for Sustainable Cities. Ben Welle is Global Health and Road Safety Manager at WRI Ross Center for Sustainable Cities.